Thankfully they have saved Notre Dame’s structure. Parisians have come together and sang “Ave Maria” in the streets. The fire seriously injured one firefighter. I haven’t seen reports of deaths or other injuries. Thankfully, important artifacts like the Crown of Thorns believed worn by Jesus and a piece of the cross survived the fire. Not only is it a Catholic church, but it has become regarded “as a feat of architecture” due to the stained glass and towers. Built in the 13th century, it has also become one of Paris’s top tourist attractions. The entire roof has collapsed. Notre Dame is now looking more like modern France… what took centuries to build is turning to ash. alaskabob: sadly, yes. Perhaps the most iconic edifice in Paris, more so than the Arc or the Tower, which simply aren’t in the same league. We shall see where this leads, if it’s simply a careless accident or something else. ISIS tried in 2016… but considering the percentage of devout … eh… individuals in France and the other ..eh… incidents over the past years… I have a strong suspicion. It would take a nuke to take out St. Peters…. but no worries about a rogue nuke from old USSR, or newly minted in Iran or NK. sarc. Frankly, a nuke from “somewhere” would be better tested on Rome than Israel before attempting to use on Israel. Hopefully some brave tourists or French citizens will film for history any “radicals” celebrating this. And one of the women involved was sentenced last Friday. I bet the Muslims campaign to build a mosque there. This is really suspicious. Some are now predicting that nothing will remain standing. A total loss. Anyone want to bet that it won’t be replaced by a mosque. Or at least something that is funded by Islamic interests? I expect it will be replaced by something that professes “unity” but extinguishes the true historic significance of the cathedral. Mosque – my first thought after reading only a few words of your post Phil. There’s already been a book written “The Notre Dame de Paris Mosque”. I am hoping and praying this event will rattle the sleeping Christians in France and bring them to their senses and back to their faith! Time is short. I guess I should have read further down before posting. Arson is the second largest cause of residential fires and residential fire deaths. In commercial properties, arson is the major cause of deaths, injuries and dollar loss. Most common cause in construction is welding. But in this case, it could be from work on the lead roof. However would they be melting lead right on the roof? The timing seems odd. It supposedly started 5-6 minutes after tourist hours. The Serbian Orthodox Cathedral of Saint Sava was terribly burnt. Basically, I think, only the walls remained. Yet, the faithful there are re-building out of the ashes. I wonder, given the state of Christianity in Europe today, whether there is such a faithful community ready to re-build the Notre Dame Cathedral, or whether this event is a sign of what is ahead for Christians. Notre Dame took 100 years to build. I have never been to Paris, but have visited St. Stephen’s Cathedral in Vienna built about the same time. These people had tremendous faith to work on a church they knew they would never live to see completed. Reminder and point well taken. I do wonder if there is such faith there in our present time. Then, again, this sad sight might awaken their consciousness and spur them to action. “……executive director, Ellen Fantini, told Newsweek that while in many cases the motive for the attacks was not known, France faced growing problems with anti-Christian violence, especially by anarchist and feminist groups. …. rising hostility in France against the church and its symbols,” but “it seems to be more against Christianity and the symbols of Christianity. On February 9, the altar at the church of Notre-Dame in Dijon, the capital of the Burgundy region, was also broken into. The hosts were taken from the tabernacle, which adorns the altar at the front of the church, and scattered on the ground…. President Trump – in the last few minutes – said there was supposed to be some renovations going on there he thought…. So there’s all this desecration of Churches across France, Notre Dame was a frequently named target of the extremists. Was there tightened security at the cathedral? If so – why wasn’t the fire found early enough to extinguish? If not – wtf? Even if this incident is not a result of terrorism, I submit that the picture of Notre Dame on fire presents a perfect visual metaphor for the ongoing phenomenon of perpetual, cowed dhimmitude evinced by Europe’s politicians, vis-a-vis the ideology of “Submission,” and, the concomitant collapse of secular democracy and the values of the Enlightenment, under the goose-stepping bootheel of supremacist and totalitarian Islam. Will this be Paris’s “9-11”? I suspect that this is just a prelude to France’s 9-11. America needs to relieve France of their nukes, to prevent them from falling in the hands of Muslims. That they just couldn’t pass up a Million or two in savings. Yeah, I’d hate to be the bonding agency right now. Am I missing something or are there no helicopter drops of water on fire? All I see are a few streams from the ground. Trump mentioned about air drops and frankly anything would be helpful. There are two aspects that I came across concerning an airdrop. One had to do with the waterproof construction of the roof (it was hindering the firefighters) and also a fire chief negated an air drop due to the dangerous nature of doing so. I attempted to backtrack to locate where I read this, but, alas, the grey cells aren’t what they used to be. So, I must qualify the above point by stating that I could be mistaken in relating them. Notre Dame of Paris is the most famous of the French Gothic cathedrals because Paris is so populated and gets so many tourists. There are dozen of massive, beautiful cathedrals across France that are comparable. Chartres is, I think, more grand. Lyon, Reims are also beautiful. St Denis, the burial church of the French kings of old, is simple on the outside but amazing inside. I’ve never been to France but have been to some beautiful cathedrals in Germany. The National Cathedral in DC is also incredible. Terribly sad to see the devastation. Glad Notre Dame in Paris is not the only surviving example though. “Thankfully they have saved its structure”??? True, Granny. However, with the size of this fire stone could get mighty, mighty hot. Water added to the mis could cause it to split. Also, there was the concern of the impact on mortar of high-pressure water hitting it. Another concern was the arches that if they went might cause the walls to collapse. Thankfully, it now appears that some of these early concerns did not happen. The structurally interesting feature of medieval cathedrals is that the weights of the roof and the buttresses balance each other. That’s why the buttresses are there. Without the roof, the buttress will push the walls inward and the whole thing is likely to collapse. They probably won’t even let anyone in to examine the damage lest it all collapse at an inopportune time. Notre Dame survived two world wars, but apparently, it cannot survive the Vandals currently overrunning Europe. Vandals or ignorant barbarians suffering from 1400 years of inbreeding? Now what kind of Ilhan Islam would do such a thing to such a nice structure? Tsk, tsk, I sure hope that those peaceful, day camping Muslims aren’t going to be discriminated against, just because they happen to be in town. We all know what kind, Mohammad did a very good job of instilling his values in those who were dull enough to follow him. There’s no way of knowing just what happened yet, but to me, one thing is very disturbing – the timing. Today is the first day in “Holy Week”, with Easter coming up on Sunday. What are the odds that of any given week to have a fire, it would be Holy Week? And, how is it that the fire was in a location where it [apparently] had lots of time to spread and get totally out of control? So maybe “some people did something”? Officials are now saying that that 75% of the structure will be saved. And it’s just before Easter. High mass on Easter which full choir and great organ at Notre Dame must be an impressive spectacle. I attended a Sunday service there on a trip and it was packed. They feature the great organ which is really something. Is this tweet for real? Yep, all too real, and it makes perfect sense — he hates Trump and what he represents, so his natural instinct, regardless of the mood of the room, is to attack him. Despite his ridiculous claptrap about Judeo-Christianity, to Ben Shapiro, that cathedral was just a funny looking old building. It meant nothing to him. That fire meant no more to him than seeing an apartment block burn somewhere in Los Angeles. 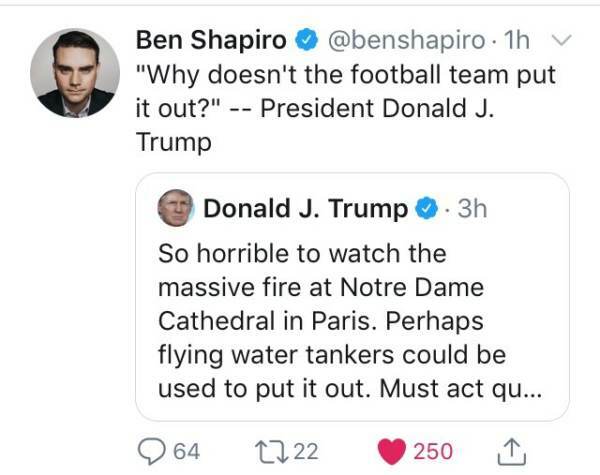 One can only hope that eventually his inability to pipe down and shut up while his target audience mourns the passing of their heritage will be a turning point in the Cult of Ben Shapiro. So… are you trying to tell me this was not a Union Project??? One thing for sure. The GoFundMe for reconstruction is going to be Yuge…. There will never be a shortage of beggars. I hope the reports they’ve saved the artifacts are real. It seems like the fire was barely contained and they’re making these statements. I think it’s pretty obviously arson, probably of the Religion of Peace variety. Modern building projects have so much fire suppression around that the speed and scale of this blaze make no sense if it were just some smoldering rags that caught fire. and there is a cult that loves to do things on the same dates. Around the planet the forces of evil have been and will continue to attack by fire and by destruction any monuments or places of religion or cultural significance related to historical or cultural, especially the culture of Western civilization. In very recent times such attacks in the USA, France, the UK, Brazil, and other places wherein museums, national monuments, and sacred venues exist have been and increasingly are targets. Preparedness and watchfulness are essential. There was an interesting mini-series “The Pillars of the Earth” which seemed semi-factual about the trials and tribulations of building back then. Gravity is not your friend. While Chartes is impressive, so are the airship buildings on the West Coast. There is a difference the Church and the Church Building. Sadly the Church Building that was in need of renovation before the fire reflected the state of the Church that needed renovation/reformation/revival. The Church in Europe has comforted to the world rather than being an influence on the world to be more Christ-like. It is a shame (to the Church) that the millions of visitors were coming to see the Church Building rather than the Church! French police have launched a criminal investigation into the Notre Dame fire. Below the fold is a map of the church’s vandalized in France last year. It is breathtaking.